Attend a user group near you! 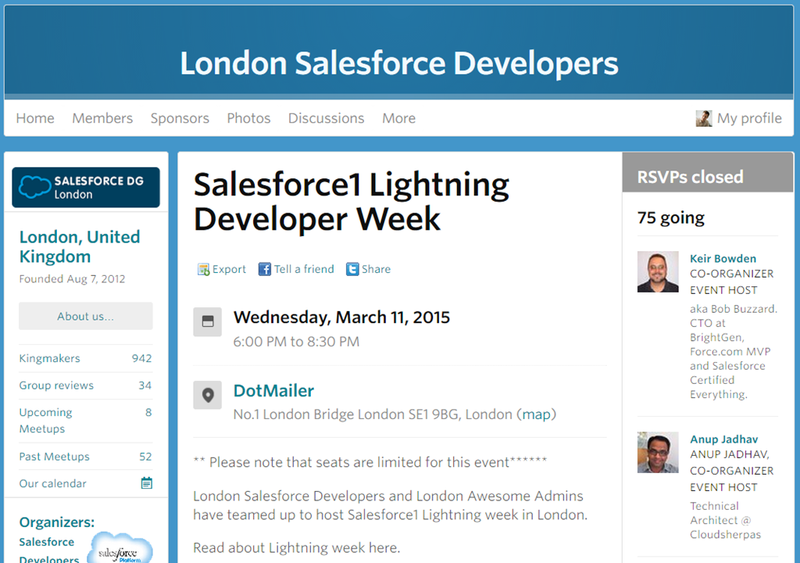 Monday the 9th March 2015 signals the official start of Salesforce Lightning Developer Week. Have you registered to attend and event at one of the UK groups? It may not be too late to sign up! 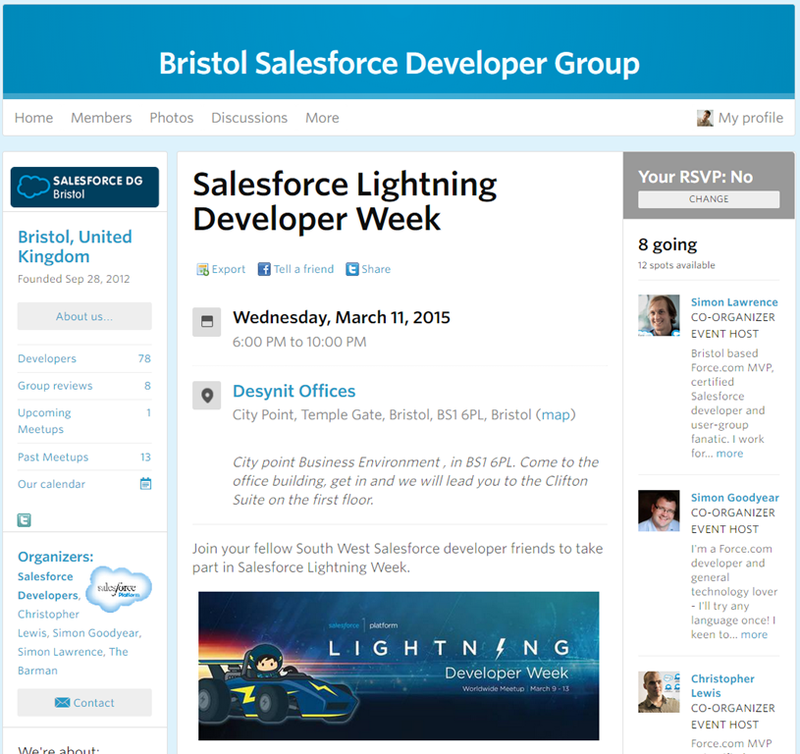 These events are going to allow you to get hands on with many of the new Salesforce Lightning product family members. 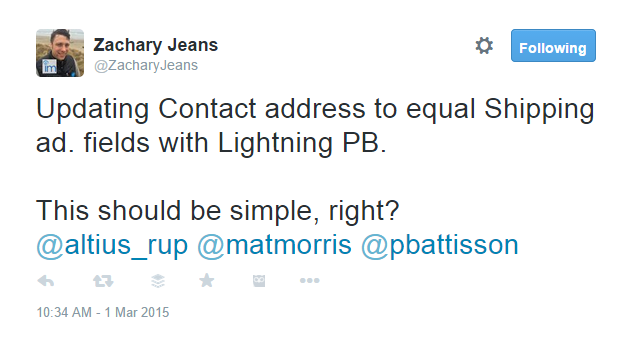 Lightning Components and Lightning App builder, for the creation of the next generation Salesforce user interface. 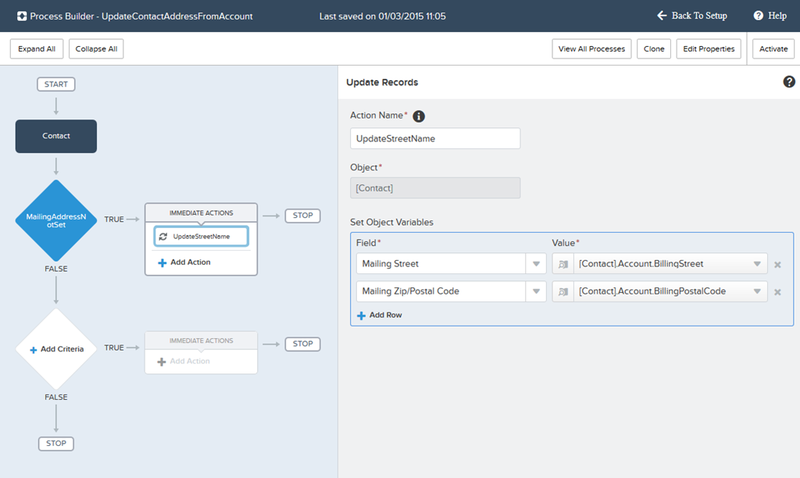 Lightning Process Builder, for the next generation of workflow, and Lightning Connect for (what I think is) a paradigm shift in line-of-business data integrations. If HM Revenue & Customs have allowed the boxes through the border, you can can also expect some nice swag items. Maybe stickers, definitely t-shirts and possibly some sponsor give away prizes. Make sure that you arrive on time to maximise your chances! The biggest benefits though will be the people you meet and the conversations that you have. Whether that is with one of the presenters or with people “just like you”, we are all going to need to work together to digest and apply all this new stuff in our projects. 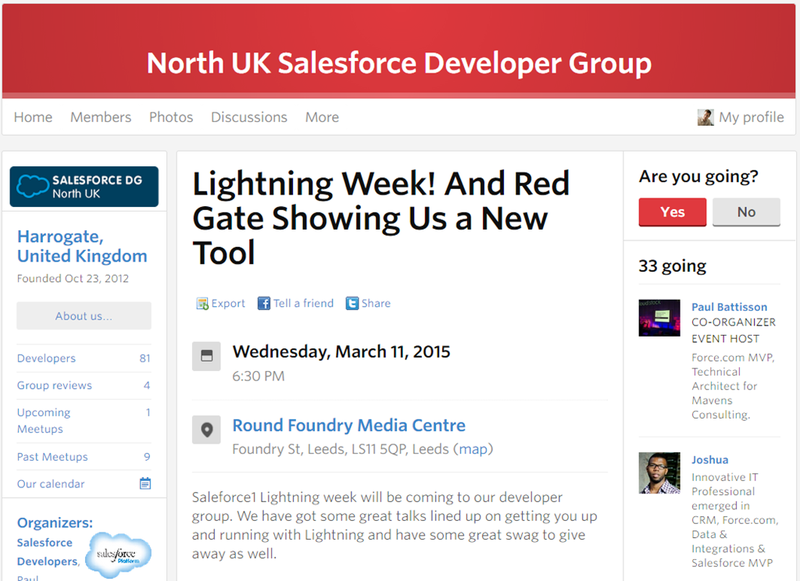 If you have anything to do with the configuration and customisation of Salesforce, Lightning Developer Week is for you. You may go by the label of being a Salesforce “developer”, or you may refer to yourself as a Saleforce “administrator”, maybe your job title may contain words like “solution architect” or “business analyst”. The content (I have seen it) is going to be relevant to you, and you’re are going to find out about, and try out first-hand, the tools and techniques which we’re all going to come to rely on to get our jobs done in the next couple of years. There is still time! Whilst the London event is sold out, there are a total of four events running in the U.K. this week. If you really can’t make it, then make sure that you join the meet up groups and attend an event soon. You’ll be glad that you did! My home town, so I am doubly disappointed to not be there with a team of talented Salesforce experts that I know well. You are assured of a warm welcome in Bristol, so what are you waiting for? I’ve not visited yet, but have heard good things about this group. Check it out if you’re based around the Midlands. Salesforce MVP & Maven, Paul Battisson will be supported by Salesforce MVPs Phil Walton & Josh Hoskins. This is a great group with lots of talented people happy to share their knowledge. Wednesday, March 11, 2015 Devs & Admins! Currently sold out. 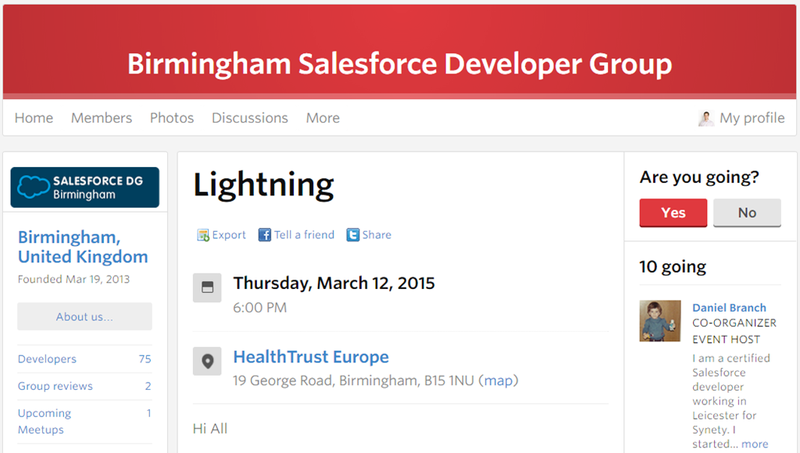 This is a joint meeting held by the developer and admin user groups. The total number of RSVPs was capped at 150, and there was still a waiting list! Just goes to show how strong Salesforce technologies are in the capital city. Along with some famous names, I will be here too! I am presenting the section about Lightning Connect. Wish me luck & I hope that you have a great Lightning Week! It’s going to go lightning fast! In last weeks “part 1” post, I introduced why I needed to log faults and information from Salesforce Visual Workflows which I have been writing . I recommend reading that post before digging into the detail here. With a custom object in which to store any fault or status messages I was able to use a simple flow component to create a new record from inside any flows which I wrote. I enhanced this pattern by having several flavours of flow to log different information. LogFault is my flow which I wire up to fault connectors in every flow that I write. When I just want to send application messages, I use my LogInfo and LogInfo flows. All three logging flows share the same structure, here is the LogFault flow. Input only, passes the message from the calling flow. Input only, passes a combination of the calling flow’s Id and name (as explained in part 1). 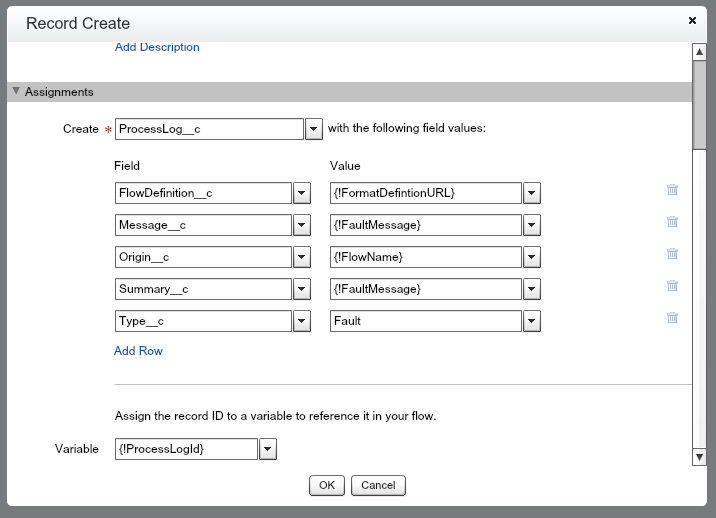 Output only, returns the Id of the created process log record to the calling flow. The formula to FormatDefintionURL takes the flow’s Id and appends it to the Salesforce URL to make a link which can be clicked to quickly access the flow definition when I am investigating any problems. 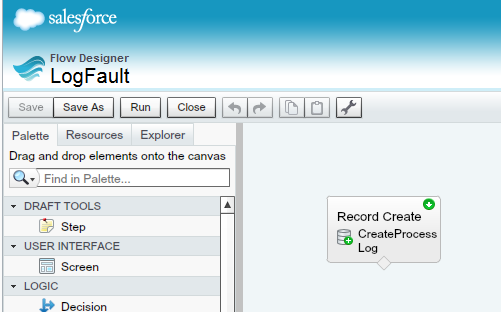 Here is how the values are mapped to the record create component as part of the call. That is all that is needed to create the flow. Don’t forget to make the start element with the green arrow. Because there is only 1 element in the flow, the editor will give a warning when the flow is saved. It’s okay, it will still run. Now the LogFault flow (and it’s siblings, LogError and LogInfo) have been created they can be used in new and existing flows. I actually went back to all the flows in our production org and updated them to add not only fault handling, but also information messages. I was very glad that I did as it helped me solve a number of logic problems and field permission errors. 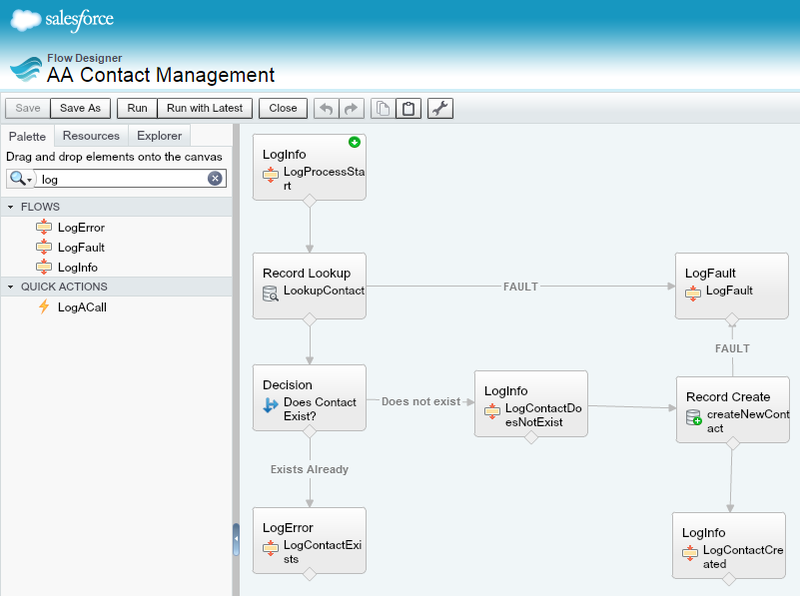 Taking the idea of adding logging to an existing flow, lets start with the following very simple flow which checks if a contact exists, and if not creates a new one before returning the Id of the new or existing contact. This flow has two data access components, if a fault is raised by them nothing is reported and nobody is any the wiser, save for maybe the original author that wrote the flow who might get a system generated email. We can do better than this! The log flows are available in the palette and can be added to the flow. The flow is transformed! It still does the same basic function, but we have two very important additional features. The fault connections are wired up for the two data access components, now if there is a problem we will have a record of it. There is also a record of the beginning middle and end of the flow’s progress. This type of information is invaluable when troubleshooting a flow. Here is the information which the flow logs when it is run under different conditions. Looking at a single record, all the captured fields can be seen. My favourite feature is the URL field as it saves me so much time to be able to jump to the flow definition when reviewing the logs. And because the process log is a Salesforce custom object I am able to use it in reports, dashboards and I’ve even hooked it up to a push topic on the Streaming API. But that’s another story for another post. I hope that these two posts have provided ideas around instrumenting your business processes, and I am sure that there is a lot more which can be done to build on this foundation. @ZacharyJeans is a Twitter machine (nearly 100K posts!). So it’s good to see him roll up his sleeves and have a crack at Salesforce’s Trailhead learning challenges. It can be hard work to get started, but social media can provide a lot of moral and practical support! The actual problem that Zachary had to solve for his Trailhead challenge was the opposite of what I explained here. In this example we have a contact which will refresh it’s address information from the parent account every time it is updated. The Trailhead challenge called to update all child Contacts whenever the account was updated. Good job I didn’t do his homework for him! Here is the walk through which I wrote at the time. I found it very interesting to see where someone new to Process Builder started with the tool. Hopefully these pointers helped, I think they did as he tweeted later showing some of his new Trialhead badges! 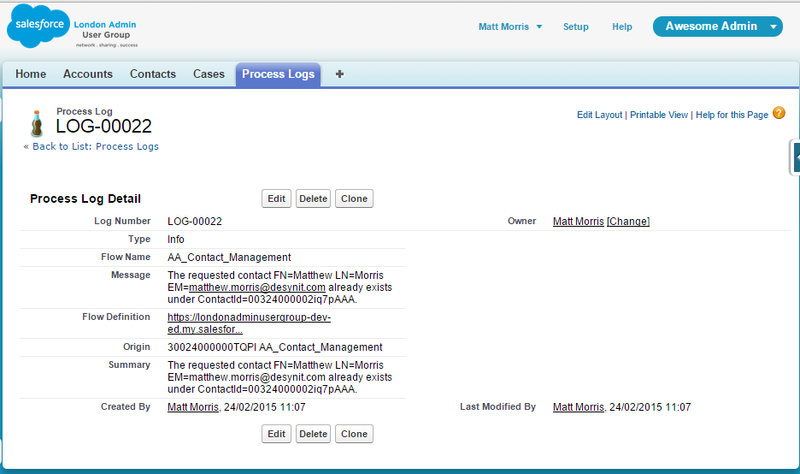 Create the process and set it to fire on create & update of a Contact record. 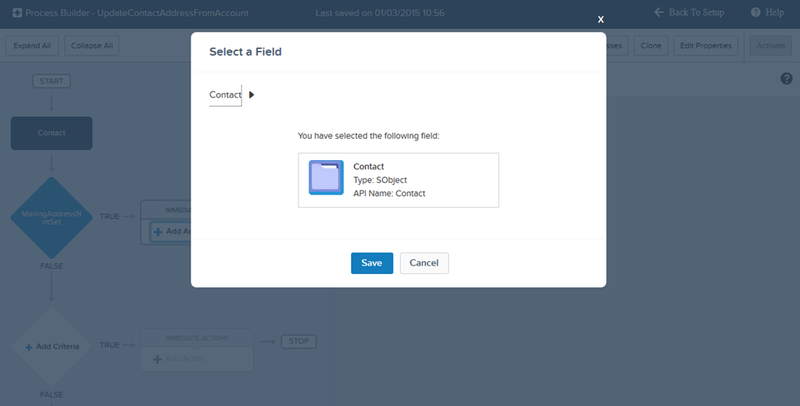 Remember though that in a nice clean Salesforce environment, when the new Contact is displayed it defaults the address fields from the owning Account. So this is more a scenario for updates. Depending on the scenario, you can set the filter conditions as needed. Here I am working with just the street and postal code. Thanks to the new feature in Process Builder, we can “OR” these conditions. In a real situation my preference here would be to have a formula field checkbox outside of the process which I would used to model the criteria. I’d call the field something like “Update Contact Address Required”. But for now, let’s use the standard fields on the object. With the criteria set, the branch to the action will be followed whenever they are true. 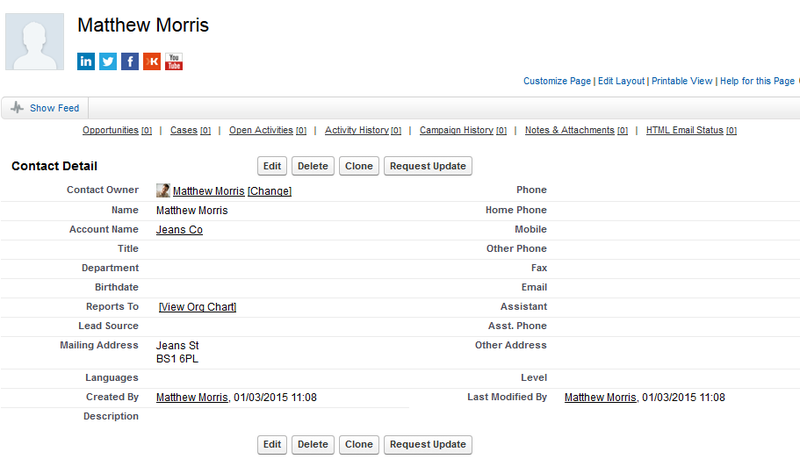 Then set the Contact fields to come from the related Account fields. Set each field, I have just updated the street and postal code. Save, Activate, TEST TEST TEST! You are going to feel so great when this runs and works first time! Here’s my new Contact with the street and postal code copied in by the process! If it doesn’t work first time, then retrace your steps. If it does run, don’t just go and have a coffee to celebrate, TEST SOME MORE! Why? Because there is a gotcha in here which will cause an error… can you find the cause? After all, this is a computer program! ….update. The gotcha is that updating a contact which has no Account will cause an error. The solution is to add an extra condition into the process filter to make sure that the update is only fired when an Account is listed for the current Contact. 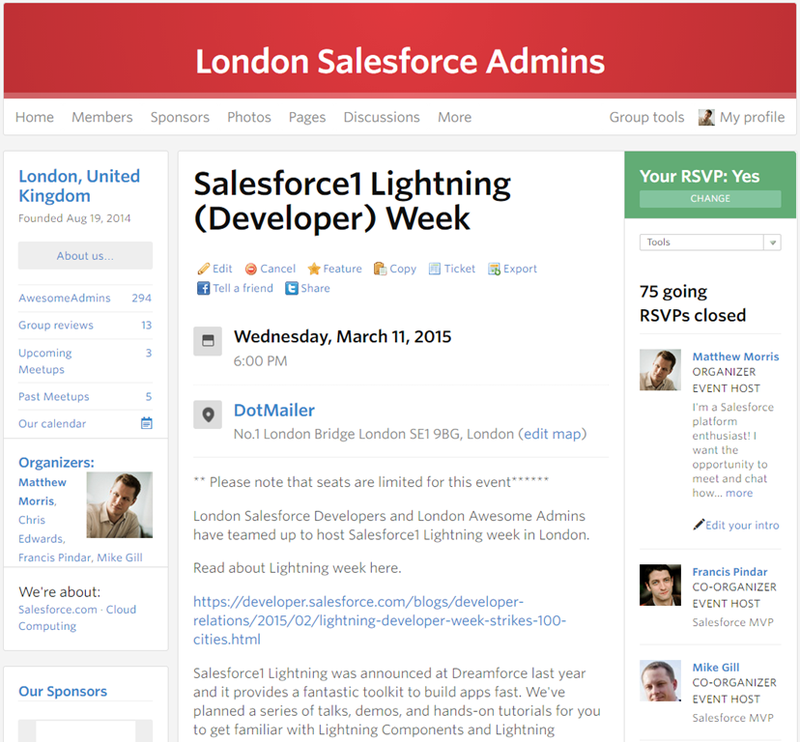 I have been experimenting with this error handling pattern for my own flows for the last couple of months and I just co-presented to a meeting of the London Salesforce Admin user group. I shared the presentation with Salesforce MVP Mike Gill, who has been very active in applying Flow to solve lots of different problems. My need for a structured approach to managing the errors thrown by a running flow came about from my work to engineer a lot of processing within my own Salesforce instance. I didn’t have the happy experience of the flow running correctly first time, that’s never going to happen. So there was a learning curve in using flow and I was finding myself struggling to uncover the reason why parts of the overall process were failing. 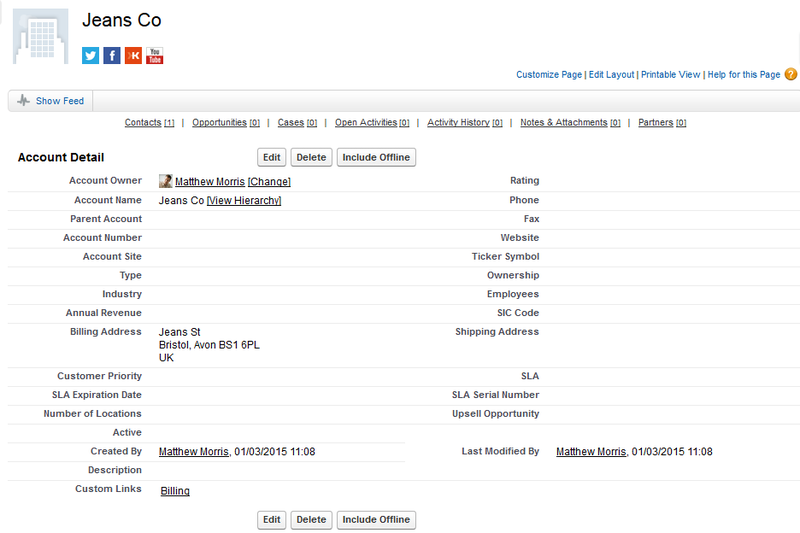 There were also situations where the flow completed but I didn’t get the outcome I was expecting, such as order records not being created or no invoice line items to accompany the invoice header. I had no visibility to the process of the flow as it ran, other than checking for record updates and creates and interpreting if my logic was correct. The muddle of my early flow development only started to fit into place when I started to record both, flow fault messages, and log messages to report the state of the system at key milestones. The solution is very simple, I don’t expect anyone to be impressed by the technology. But, if like me you find yourself wanting to track faults and successes from your flows, maybe this is a software pattern which can help you. The fields within the object allow me to perform useful functions with the Process Log when it’s displayed. Having different types of log entry will allow me to filter by Fault/Error/Information. The role of these fields is simple, capture the message text sent from the flow. This could be the fault message text when something goes wrong, or it could be an informational message indicating that a milestone has been reached. The Summary field is a shorter version of the Message long text field and will contain the first 255 characters of the message. Having a simple text summary allows the start of the message (often the whole message) to be cleanly displayed in list views and used in other places within Salesforce where long text fields are not in favour such as formulas and streaming API topics. The Flow Definition field is a URL was a late addition to the pattern but have proven to be very useful. 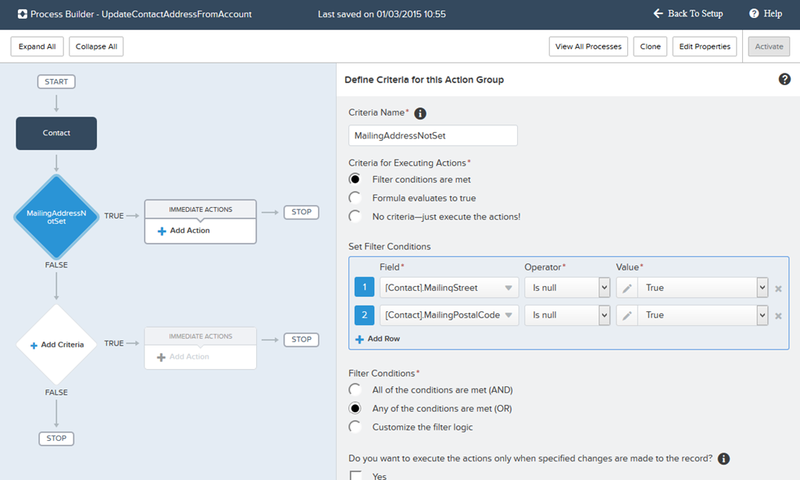 Using the Id portion of the Flow Name in combination with the URL of the Salesforce org provides a very quick and easy way to open the flow definition and start looking for the cause of the fault. 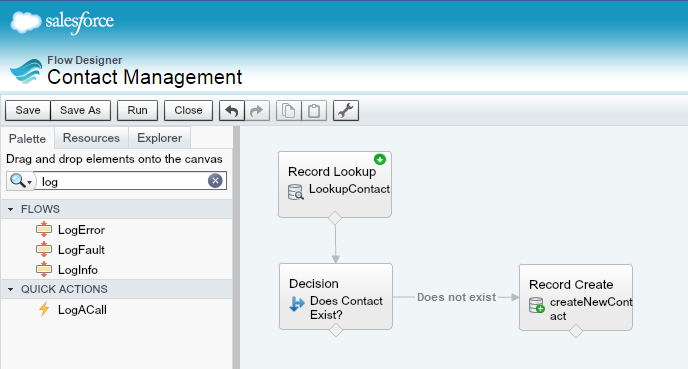 Set up the custom object and have Salesforce add a tab for it, and I now have everything that I need to understand how my flow is behaving, and when it is misbehaving. I have reviewed a lot of sample flows, and read a lot of blog posts written by other Salesforce users who have been making use of this technology. In all the examples I am very surprised that the topic of fault handling is very often absent. In any system errors are inevitable, and we need to plan for them happening. 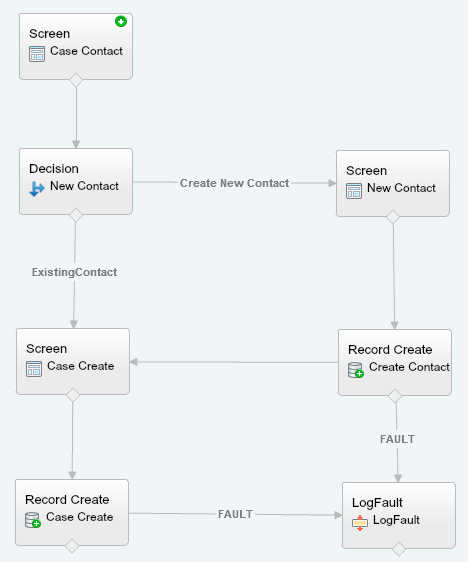 Salesforce Flow provides what are called “Faults” for many of the components which can be placed onto the design surface. Any component which accesses the database (Creates, Updates, Fetch) provide a fault connector. 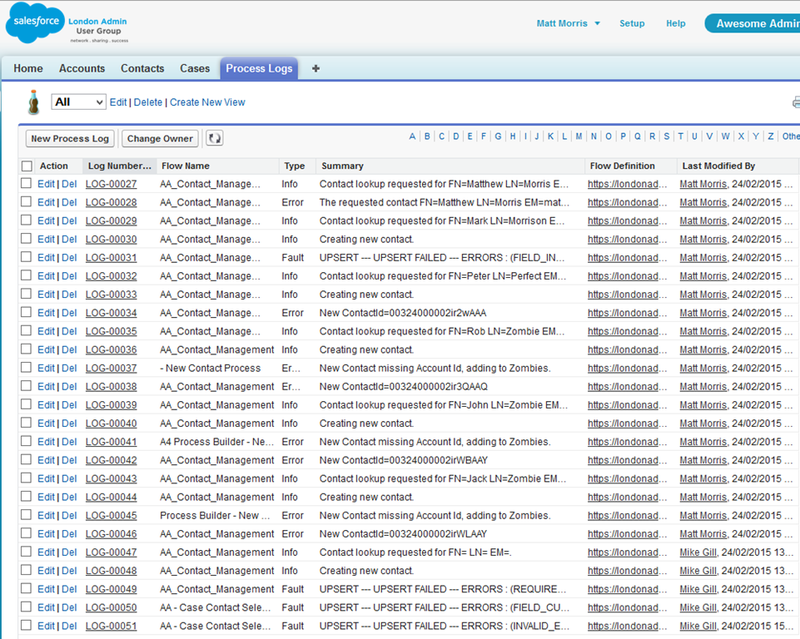 Here’s the documentation from Salesforce about Flow Fault Connectors, so I don’t need to write them. My approach is to make sure that I use the fault connector for every component in my flow which can return a fault. In order to do that in a way that is reusable I created a flow specifically for logging fault messages. I even gave it a simple name “LogFault”. In every flow that I write I make sure to add a sub-flow to my LogFault and make sure that all components which can raise a fault are wired up to it. 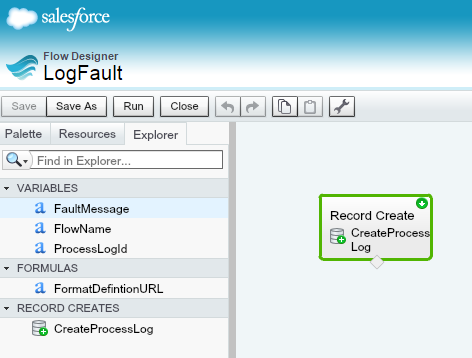 The contents of the LogFault flow could not be simpler, it’s a RecordCreate call to the Process Log custom object. In the next post I will describe the anatomy of the LogFault flow, and describe how to make additional flows to LogError and LogInfo. In celebration of #FlowFeb I describe the common problems I encountered when adopting Flow. If you are starting out with Flow, I hope that you will find a few guiding principles below. Next time I will go into more detail about how monitoring the progress of Flows helped me improve quality, and my productivity. I’ve been writing Flows in earnest for about 6 months now, since the pilot/beta for Flow triggers came about and made it possible to run background processing. In the beginning I was VERY lazy and didn’t bother to put any error handling into my Flows preferring to hope for the best when they ran. In my defence let me say that the Flows were running in developer orgs or a very quiet corner of the Desynit live org, just to see what was possible. My first piece of advice is to point out that hoping for the best and implementing business processes are not a healthy combination. First of all, if a business process is supposed to happen and it doesn’t, somebody is going to be unhappy and start looking for you. Second, if there is no alert or evidence that something went wrong it’s doubly bad (and they will realise eventually and come looking for you!). My most immediate problem though was that my Flows weren’t running correctly first time, or for quite a few times during development and testing. This was leaving me frustrated as I battled to develop my Flows. If I was going to make use of Flows seriously to solve real world problems for paying customers then I was going to have to up my efficiency and productivity, and that meant getting stuff working quicker. I quickly found that it was possible to monitor Flows in near-real time by having the Developer Console open when I test ran the Flow. Just as with debugging classic workflow and Apex, this was an easy way to capture the log and then read/search through it to find out what’s gone wrong. 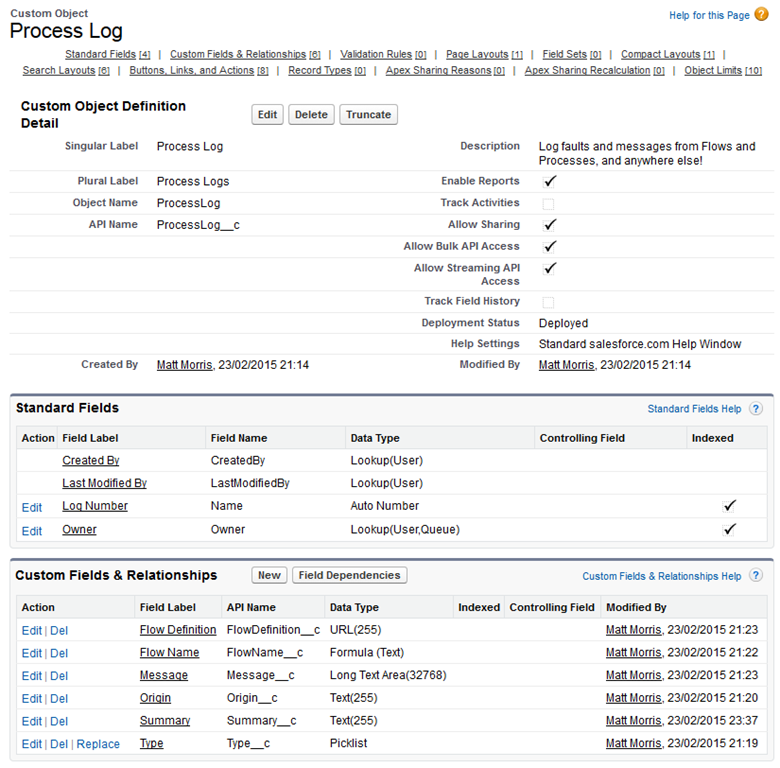 I was able to use debug logs and the Developer Console to sus out the cause of Flow misbehaviour (“misbehaviour” is what I am choosing to call the results of my early slap-dash Flow programming) and these logs were helping me along the road of exploring the capability of Flow to model more complex business processes within our own live Salesforce org. Capturing logs worked well for development and testing, and taught me a lesson (as if it ever needed to be taught) that I needed to make sure I caught every exception which was raised in the Flow. I ran into so many unexpected “unhandled exceptions” when first deploying my Flows. The most common cause was that the Flow user did not have permission to update a field referenced in the Flow. I banged my head against the wall many times, even with what I thought were the simplest of business processes, but Flows were just grinding to a halt because of field permissions. That’s a whole other blog post, but take my advice and have a Permission Set for each of your Flows and make sure that the objects and fields in the Flow are set to read or write access as needed by the Flow. My next lesson came from trying to support my colleagues the first version of an invoice processing Flow which I had written. There were problems with field permissions (I had not taken my own advice to have a Permission Set for the Flow), and also data scenarios which the Flow was not yet set up to handle. In some cases I had exception handling which was reporting the fault to the user on their screen, in other cases the fault was not handled, and the Flow died in front of the user with a generic message. For all my energy and enthusiasm about Flow and what is was going to do for us, they were not very impressed. I had my first Flow in production but it wasn’t working smoothly. The feedback that I was getting from the users varied in quality and detail, and I could not always be on hand to look over their shoulder and get the information needed to correct the problem. What I needed was the ability to capture not just the fault message from the Flow and any other information which would give me as much detail as possible so that I could understand how far the Flow was getting before it failed. I needed to instrument my Flows..
Search #FlowFeb on Twitter for a selection of posts from other Flow fans.